The FBI has reopened a conservative organization's request for information about former Attorney General Loretta Lynch's meeting with President Bill Clinton after denying last year that there were any relevant records to disclose. The American Center for Law and Justice's Jordan Sekulow said Wednesday he has received a letter this week from the FBI's chief of records management saying that the agency had determined that there may be "responsive" FBI records to the group's Freedom of Information Act request last July and so he had reopened the case. The letter reopening the FOIA dated Aug. 10 came after Sekulaw pointed out in an appearance on Fox and on the ACLJ's website that it had recently received documents from the Department of Justice (DOJ) showing that FBI emails and other agency documents exist about the tarmac meeting. Critics of Comey's handling of the agency's investigation into Hillary Clinton's email abuses point to the tarmac meeting as a turning point in the probe. 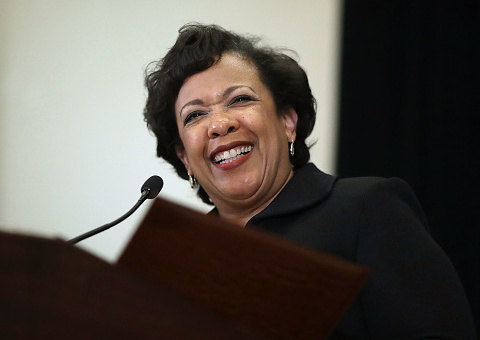 After the late June meeting created a media firestorm questioning whether Lynch could remain impartial in the probe, Lynch announced that she would accept Comey's determination on whether or not to indict Clinton based on the FBI's email findings. "It is clear that there were multiple records with the FBI responsive to our request and that discussions regarding the surreptitious meeting between then-AG Lynch and the husband of the subject of an ongoing of an ongoing FBI criminal investigation reached the highest levels of the FBI," Sekulow wrote on this website. He also said the FBI's claim last year that no responsive documents existed is a "direct contravention to the law" and the group will continue its legal fight to "hold the FBI's feet to the fire and demand an expeditious and thorough search for all documents responsive to our request." "We know they exist, and we're willing to go to court to get them if necessary," he said. The Justice Department documents the group received include several emails from the FBI to the DOJ officials concerning the tarmac meeting. One with the subject line "FLAG" is a conversation between FBI officials and DOJ officials concerning a media report about a "casual, unscheduled meeting between former President Bill Clinton and the AG." In the email string, the DOJ official tells an FBI press official to "let me know if you get any questions about this" and provides "[o]ur talkers [DOJ talking points] on this." Another email to the FBI contains the subject line: "security details coordinate between Loretta Lynch/Bill Clinton?" Additionally, on July 1, 2016, a DOJ email chain under the subject line, "FBI just called," indicates that the FBI is looking for guidance in responding to media inquiries about news reports that the FBI had prevented the press from taking photos of the Clinton-Lynch meeting. An hour later, Carolyn Pokorny, Lynch's deputy chief of staff, said in one email, "I will let Rybicki know." Jim Rybicki was Comey's chief of staff. The information in the email that was provided to him was redacted, along with several other documents in the DOJ email cache the ACLJ received with notes that the redactions were requested "per FBI." This entry was posted in Issues and tagged Bill Clinton, Department of Justice, FBI, FOIA, James Comey, Loretta Lynch. Bookmark the permalink.